If you're ready to jump in with both feet, we've got the package for you! 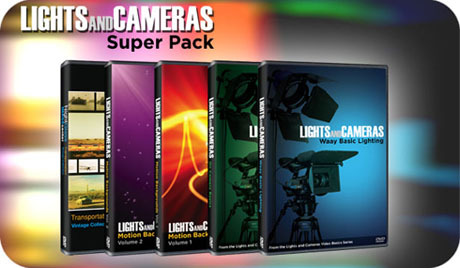 For the Lights and Cameras Super Pack Price of $99.00! looking videos RIGHT NOW! Learn how to improve your video lighting with equipment from your local hardware store. Become a more polished on-camera presenter to better sell your product or service. Make your videos pop with graphic backgrounds and elements designed by award-winning broadcast designers. And finally, interject some fun into your next project with some campy clips from our Vintage Collection. It's all here, so get your Super Pack and get started!